Indianapolis – It was like old times – good old times – Thursday night in Indy. Standing at the front of the downtown Marriott ballroom, telling stories and giving each other a hard time, were, among others, Danny “Hollywood’’ Sullivan, “Rocket’’ Rick Mears, Tom “The Gasman’’ Sneva, Johnny “Lone Star JR’’ Rutherford, Duane “Pancho’’ Carter, Al “Little Al’’ Unser and Mario, no other name needed to identify the longtime open-wheel star. This distinguished group was on hand because the Indy 500 Oldtimers Club was honoring the drivers from the 1985 race, won by Sullivan after surviving a spectacular mid-race spin. It’s amazing that 25 years have passed, but the faces, perhaps a bit more lined, were still the same, and the personalities still very much intact. People knew these guys. Even casual race fans knew them, knew their racing resumes and their nicknames. Sadly, those days are gone at Indy. Check out the 33-car starting lineup for Sunday’s 94th running of “The Greatest Spectacle in Racing’’ and few of the names jump off the page or screen. There’s polewinner Helio Castroneves, the three-time Indy 500 winner who is known as “Spiderman’’ for his wall-climbing victory celebrations, and former race winners Dario Franchitti, Scott Dixon and Dan Wheldon, along with glamor girl Danica Patrick and rising star Graham Rahal, the son of a 500 winner. Otherwise, most of the participants would not draw a crowd outside the confines of the famed Brickyard. That’s a big reason why the popularity of IndyCar racing has reached a dangerously low level, even at its biggest event. Everyone who has followed auto racing knows that one reason for that is the 12-year internecine war that pitted the Indy Racing League against CART and later its spawn, the Champ Car World Series. The bitter split divided the solid base of open-wheel fans in America. Some moved their allegiance to NASCAR and others simply lost interest in racing and sought other diversions. But the war has been over for more than a year now, with Champ Car giving up the ghost and being absorbed into the IRL’s IZOD IndyCar Series. Still, the series struggles to put fans in the grandstand and suite seats everywhere but Indy and to get others to turn their TVs to broadcast partners ABC and Versus when the races are on. The economy has played some part in the lack of a bigger response to the coming together of the open-wheel sport. NASCAR has been hurt by the economic downturn, too. But there’s more to this than just bitter memories and a dearth of fans and sponsors because of economics. On the plus side, Sunday’s race will still draw the biggest single-day crowd in all of sports, worldwide. There will be around 250,000 spectators on hand for what shapes up as a very fast, very competitive race. The stands will be full, but there are considerably fewer seats than before the 1996 split, when more than 400,000 people showed up for Indy each year. The TV numbers on ABC will be decent, but NASCAR’s Coca-Cola 600 later in the day will likely have bigger ratings, as has been the case for a number of years. At least part of the reason is what my very smart wife calls lack of a group mythology. In other words, charismatic drivers no longer drive the sport and draw the fans. Most of those nationally known heroes reached the end of their road, retiring in bunches in the late 80s and 90s, leaving a very large void right at the moment when open-wheel racing was facing its biggest crisis. Worse, the drivers who came in to take their rides were mostly foreigners. 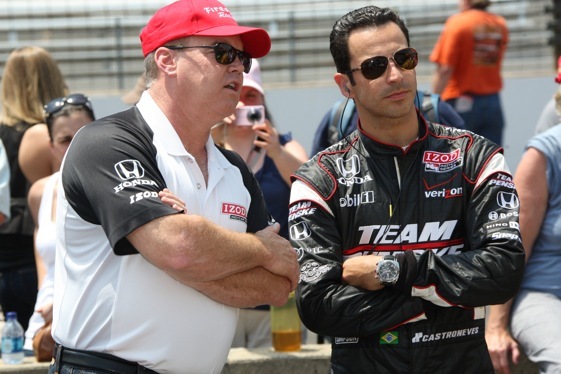 Indy has always been an international race, but the lack of American drivers over the past 14 years has been noticeable and unwelcome. Many of the foreign drivers came with decent skills and, more important, sponsorship money that young Americans could not find. But the American public has not embraced most of them. New IndyCar CEO Randy Bernard has been on the job for 90 days and is taking in his first Indy 500. But it didn’t take him long to figure out that the sport needs more heroes. “We’ve got to take the helmets off these guys so people get to know them and we need to continue to improve and grow our ladder system to make sure that we get our share of the great, young American drivers,’’ Bernard said. He’s definitely got the right idea. It’s time to build some new IndyCar legends. Until that happens, it won’t be the same old Indy – and that’s a shame. Eight U.S. born drivers out of 33; less than 25% of the field and that is indeed a problem. Indy cars racing only a couple of times a month is also a problem. It’s hard to get and stay interested in a series that does not race much. Indianapolis in part has been a traditional large draw because there are so many racing fans in the immediate area, people who are passionate about local racing on the very large number of tracks in the area. While things can never go backwards, the stars of the Indy 500 used to race at local tracks and had a solid fan base by doing so. As a kid is the 1960’s (yes, I am old) we were treated to the likes of the Unser brothers, A.J. Foyt, Lloyd Ruby and many others racing all out on the High Banks of Belleville, Kansas. With so much down time, why cannot today’s Indy racers show up at Knoxville, Eldora, Irwindale, etc. to build a stronger fan base and frankly to not appear so “foreign” to people who love open wheel racing?